Cliffe is a village on the Hoo Peninsula in Kent, England, reached from the Medway Towns by a three-mile (4.8 km) journey along the B2000 road. Situated upon a low chalk escarpment overlooking the Thames marshes, Cliffe offers views of Southend-on-Seaand London. It forms part of the parish of Cliffe and Cliffe Woods in the borough of Medway. The population of the village is included in the civil parish of Cliffe and Cliffe Woods. In 774 Offa, King of Mercia, built a rustic wooden church dedicated to St Helen, a popular Mercian saint who was by legend the daughter of Coel ("Old King Cole") of Colchester. 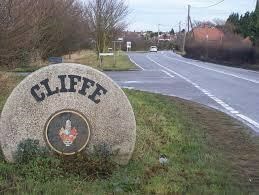 Cliffe is cited in early records as having been called Clive and Cliffe-at-Hoo. During the 14th century Cliffe was the site of a farm owned by the monks of Christ's Church, Canterbury, when the village had a population of about 3,000. In the late Middle Ages the village of Cliffe supported a port, which thrived until a disastrous fire in 1520 stifled its growth, marking a period of decline, accentuated by the silting of the marshes of the Thames Estuary. Cliffe-at-Hoo was still considered a town in the 16th century, but by the middle of the 19th century the population had slumped to about 900. In 1824, construction of the Thames and Medway Canal was begun, providing work for able-bodied villagers and other labourers who came to the area, increasing the population again. However, the canal project was a short-lived enterprise, superseded by the development of the railways, although the canal route, including the Higham and Strood tunnel (2.25 miles in length, in two sections) was used by South Eastern Railway from 1845, bringing a branch line to Cliffe in 1882. You are looking for a double potted micro. jurer jurry zrrgf zhq ba gur yrsg nf lbh ybbx ng gur sebag bs gur fvta.